In this quick review of Gold Opinions I’ll be going over everything you need to know about it before signing up. Whenever you come across any online money making program it’s a good idea to do a little research about it before giving up any money. Will you really get paid up to $50 for taking a single survey, or are they just trying to scam you out of your money? Let’s dive in and find out what this place really is! Is Gold Opinions Recommended? NO! 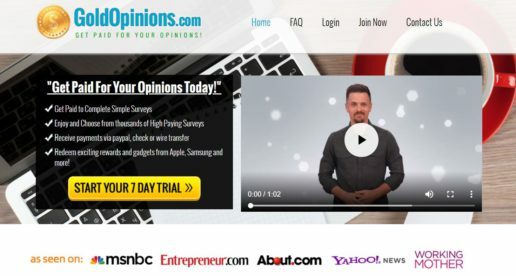 Gold Opinion claims to be a place where you can make a lot of money online just from giving your opinion by taking surveys. There are plenty of websites out there that will pay you money to give you opinion on various topics. However most of them only pay $0.50 to a couple bucks at most for taking lengthy surveys. Gold Opinion claims to pay you $5 for 10-15 minute surveys, and even up to $50 for premium surveys. You probably arrived at the review simply because you were skeptical and thought that it simply sounds too good to be true. Is there any truth to these claims, or are they just trying to mislead you or scam you out of your time? Let’s dive into it and find out what Gold Opinions is really about. Before we get to deep into this review I want to go over some of the good and bad things I could come up with about Gold Opinions. Over the next few sections I’ll be taking the time to go further in depth about all of the points that I listed out above. What Is Gold Opinions Really? What Gold Opinions claims to be and what it actually is are two completely different things. There are plenty of survey companies out there that will pay you to answer some questions. However, not a single one of them is anywhere near as good as Gold Opinions claims to be. The truth is that Gold Opinion is not an actually survey website. It just refers you to other legitimate survey website where you can make money for answering questions. The problem is that none of the survey websites that it refers you to come even close to living up to the claims it makes. The survey websites that you’ll be pointed to are just normal sites that will pay you anywhere from a few cents to a couple bucks per survey. You aren’t going to be able to make anywhere near the amount of money that they promise you. It’s just trying to lie and mislead you into paying money for information you can get for free in other places. Over the next several sections I’ll be going over all of the lies and misinformation they use to trick you. CLICK HERE TO LEARN ABOUT MY TOP ONLINE MONEY MAKING PROGRAM! The main goal of Gold Opinions is to get you excited to make a ton of money just from taking a few simple surveys. If you’ve never actually spent time taking online surveys, then you probably don’t know just how little they pay. It’s so incredibly easy to take surveys, so everyone out there wants to make money doing it. There is so much demand for it that the companies don’t have to pay much money to get people to do it. This is why you’ll only be able to make some extra pocket change doing it. Gold Opinion claims that you’ll be able to make anywhere from $5 to $50+ per survey. To put that into context, most people will be lucky to make $50 in a month of taking surveys. It can certainly be convincing when you see other people claiming that they’re making a ton of money from the surveys. However the truth is that the testimonials on the website are simply fakes. I know it sounds amazing that a guy is make $1,500 per month just from surveys, but it’s simply not true. The creators of the website simply found some stock images online, and wrote random quotes next to them. As I’m sure you might’ve figured out by now, just about everything on the Gold Opinions website is either fake or a lie. Let’s go over some of the other ones I could find. Firstly, they try to make it seem like they have been featured on websites like MSNBE and Entrepreneur.com, and it hasn’t been. You can go to either of those websites and search for Gold Opinions and you won’t find anything about this website. I also want to point out the fact that the spokesperson/creator of this website is just an actor. There is nothing wrong with having a paid spokesperson, but I’ve seen him in multiple other scams out there like My Online Dream Biz and Home Income System. Is Gold Opinions A Scam? At the end of the day it’s up to you to take the information that I’ve given you about Gold Opinions, and decide for yourself whether you think it’s a scam or not. They will connect you to legitimate opinion websites where you can make money. However they completely lie to you and mislead you into thinking that you’ll be making a lot more money than you actually will. Not to mention they will be taking your money for setting you up with survey websites that can be found with simple Google Searches. Regardless of whether or not you want to call Gold Opinions a scam, you definitely should not give them your money. Actually Make Notable Money Online! If you’re interested in earning more than just some pocket change online, then I have a suggestion for you! My Top Ranked Program will teach you how to make money by selling other people’s products online. There’s not packaging, shipping, or even touching any products involved. Companies will pay you a commission for getting other people to purchase their products and services. Since going through the training I’ve been able to make enough money online to quit my day job and work completely from home! With that being said, it takes actual time and work to succeed using the method that they teach, it’s not a get-rich-quick scheme. Is Gold Opinions A Scam? What Do You Think? Let Me Know In The Comments Below!